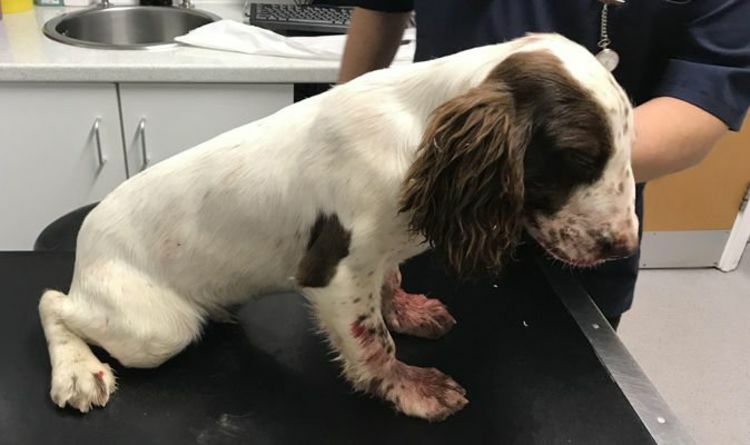 Adorable Cassian the five month old springer spaniel suffered horrific injuries to his face after a suspected car accident but was left wandering on a back road bleeding heavily. RSPCA cruelty investigators are trying to piece together what happened to the liver-and-white marked puppy who was not fitted with a microchip and was badly infested with fleas when he was found. Luckily, a member of the public spotted Cassian on a remote road near Orsett in Essex and raised the alarm. As vets carry out delicate surgery on the puppy, the RSPCA is reminding motorists of their legal responsibilities to dogs on the road. A spokeswoman for the charity today said: “Legally, it is a requirement to report to the police if you hit a dog with your vehicle. RSPCA Inspector Jemima Cooper is investigating how Cassian was left in such an appalling state. The inspector said: “Poor Cassian is still very young puppy and was in a bad state when I collected him. “He was covered in blood with injuries to his face and a broken jaw which will require an operation to fix. "He is now receiving veterinary treatment to bring down his temperature and strong pain relief to keep him comfortable. He is in a bad way, poor little guy. “At this stage, we do not know if the puppy is owned and was lost when he was hit by a vehicle, or whether the pup has been abandoned. More than 4,000 large animals died on major British roads last year, with both cats and dogs featuring on the list of casualties. Deer accounted for 1,117 deaths, while badgers were the second highest victims with 915 reported as roadkill. Cat fatalities accounted for 340, or nine percent, of the death toll while 286 dogs died (seven percent). The figures were collated by Confused.com from FOI requests. In a guide on what to do if they hit an animal, the financial services comparison website advises drivers how they must report accidents to police if they involve dogs, horses, cows, pigs, goats, sheep, donkeys and mules under the Road Traffic Act 1988. · Anyone who has information about Cassian or what happened is urged to contact the RSPCA appeal line on 0300 123 8018.